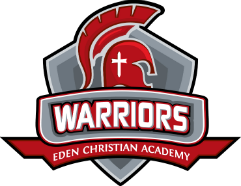 Eden Christian Academy is a member of the Pennsylvania Interscholastic Athletic Association (PIAA) and Western Pennsylvania Interscholastic Athletic Association (WPIAL). Our nickname is the Warriors. In conjunction with the mission and core values of Eden, the Athletic Department is unreservedly committed to seven distinct foundational areas of focus in all levels of athletics.